We’ve seen how to play Mega Moolah, and we also know where to play Mega Moolah, but have you ever wondered about those lucky so and so who’ve actually won the Mega Moolah Jackpot? We’ve done a little research of our won to see who’s won what and see that it’s made several multi-millionaires over the past decade alone. The Jackpot always creeps back up in the multimillion status so keep an eye out for when the most lucrative time to play it is. Will you be the Next Mega Moolah Millionaire? It would simply take us all day and many lines of writing, to list every single Mega Moolah Winner since the progressive slot launched back in 2006. So, we've taken a handful from over the years and explained a story about them as well, so you can see that the Mega Jackpot does pay out - and payout it does on a very regular basis! One of the more original wins back in the day, came in the jackpot amount of €6.3 Million to a very lucky player from Greece. Known only as Georgios, he wagered an equivalent to about €5 and came away with an absolute fortune: €6.3 Million. This was back in the earlier days of online casino, and was, at the time, the biggest online casino jackpot win in history. Although that sum has now been beaten by the likes of Netent's Mega Fortune, to a lucky player in Finland who broke the record with a €17.3 Million win, Georgios was a lucky fellow indeed. It’s not a small amount of money, but knowing you put a little wager of €5 – that must have felt out of this world when the bonus round popped up and he took it down! In his own words: "I cannot believe it" and then I sat there in quite a long silence! Georgios was smart as €5.6 Million is a life changing amount, and something that doesn’t happen too often in one person life – he got a financial adviser to assist with his newly won millions. Congratulations! Another large jackpot win went to a Finnish Player who lives in Turku, Finland. This amount was slightly smaller than some jackpots which have been won, but it's still an amazing $5.5 Million! This was in April 2008 and by this time this lucky player was deemed lucky as he was Microgaming's lucky thirteenth millionaire made my Mega Moolah! Wishing to remain anonymous, and we all agreed here that we would too if we won a progressive jackpot, the Finnish winner only put on a small few dollar bet – and came amount with this amazing win. As the saying goes – you gotta be in it to win it, and he sure was that day. A 29-Polish male who hails from beautiful Warsaw city, won a whopping €1.2 Million playing a leading online casino. Radoslaw went to the UK to collect his huge cheque and told the millionaire maker company Microgaming just what he intended to do with some of his winnings. He explained that he hadn’t bought any new clothes for at least six months, and that since he was in the shopping capital of the world, we would go on a shopping spree to the best stores to treat himself, including Harrods and Selfridges. He also explained that he felt incredibly lucky to have landed this whopping win, and that he would be very wise with the rest of the millions of winnings, adding: I’d like to buy a car and then manage the rest by investing into bonds and properties We even heard of a whisper about a proposal to the lucky lady in his life too. We’re really happy for Radslaw and we hope all of his dreams came from from there on. Good news to all the ladies reading among us, as on August 29th 2010, lady known only as ‘Mrs. P’ won over € 4.1 million Euros whilst playing Mega Moolah. We bet that date echoes in her memory forever! It was reported at the time that Mrs P was incredibly overwhelmed by this life changing fortune that she needed to get used to the idea as she never thought it would happen to her – but it did. We say well done and good you Mrs P, we hope it’s brought you some fun times and some great life changing experiences. To win the Mega Moolah Jackpot you need to randomly hit the slot so you get the Bonus game 'Wheel of Fortune/ screen to pop up, which looks like the one below. It can happen to anyone so good luck! 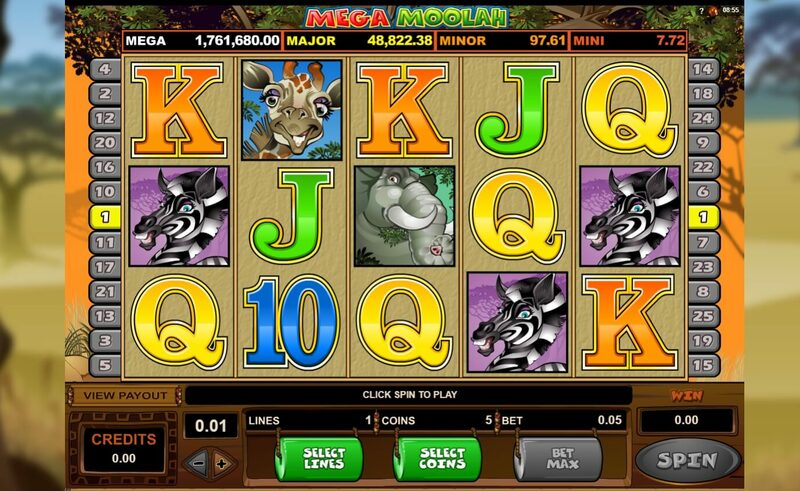 Try out Mega Moolah on one of our recommneded casino sites which are guaranteed to be one of the best casinos online.